The Schweizer 330 and 333 are turbine-powered developments of the Schweizer 300 light piston-powered helicopter. 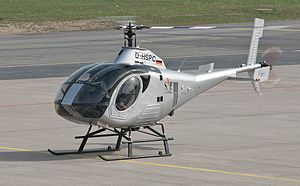 As of 2007, only the Schweizer 333 remains in production. In February 2009, the 333 was rebranded as the Sikorsky S-333. In 1987, Schweizer announced development of the Schweizer 330 using the dynamic components, rotors, controls and systems of the 300C; however, it was redesigned with an all-new fuselage. The first 330, converted from a 300C and powered by an Allison 250-C10A, flew on June 14, 1988. The FAA certified the aircraft in September 1992. The improved 330SP was introduced in May 1997 and featured an improved rotor and raised skids, which could be retrofitted to previous 330 models. An Allison (later Rolls-Royce) 250-C20W turboshaft was derated to 165 kW (220 hp), giving the 330SP excellent hot and high performance, maintaining power output to 18,000 feet. Shortly after the release of the 330, Schweizer began work on upgrading the dynamic components of the Schweizer 330SP. Over two years later, Schweizer released a new variant, the Schweizer 333. Featuring the newly developed dynamic systems components and new-technology rotor blades with a cambered airfoil and a larger diameter rotor, the upgraded helicopter benefited from a greater max gross weight, more useful load, more speed and more hover performance; nearly a 30% increase in performance over the 330SP. Schweizer created a kit to upgrade Model 330 and 330SP aircraft. In February 2008, an improved version of the series, the Schweizer S-434 was released. The 330 used the 300C's dynamic components, a Rolls Royce 250 turboshaft engine, and a new four-seat cockpit/cabin and body and new instrumentation. Schweizer was purchased on August 26, 2004, by Sikorsky Aircraft. The Schweizer 300/333 models fill a gap in the Sikorsky helicopter line, which is known for its medium and heavy utility and cargo helicopters. Sikorsky has since taken advantage of Schweizer's rapid prototyping technology, originally used during development of the 333 dynamic components and the RQ-8 prototype, to develop the X-2 Technology Demonstrator. Using the 300C dynamic components, Schweizer mounted a Rolls Royce 250-C10A engine to the airframe and developed a new four-seat cockpit/cabin and body. improved rotor and raised skids, Rolls Royce 250-C20W engine. Featuring new dynamic system components, new rotor blades, and high skids as standard equipment, the 333 has a 30% greater useful load than the 330SP. The Northrop Grumman MQ-8B Fire Scout is an unmanned derivative of the Schweizer 330SP/333 helicopter, with a new fuselage, new fuel system, and UAV electronics and sensors. It also utilizes a new four-bladed rotor system based on that of the Schweizer 333. The Fire Scout is currently in development for the United States Navy's VTUAV program with cooperation from Northrop Grumman. The original RQ-8A was based on the 330SP. Based on improvements developed for the MQ-8B, this is a new version of the 333, having a four-bladed main rotor. ^ "Escuela de Helicópteros". aeroflight.co.uk. Retrieved 15 February 2013. ^ "Dominican Republic Schweizer-333". Demand media. Retrieved 17 February 2013. ^ Philippe Chapleau (29 November 2015). "DynCorp signe pour cinq nouvelles années de soutien au profit de l'Alat saoudienne" (in French). Ouest-France. Retrieved 2 December 2015. .
^ "Royal Saudi Land Forces". http://www.scramble.nl. 2015. Retrieved 2 November 2015. .
Wikimedia Commons has media related to Schweizer 330/333. This page was last edited on 17 March 2019, at 08:14 (UTC).